When you or your crews are mowing lawns, there are hazards and safety concerns on every property. It’s vital you and your team stay safe by wearing the right personal protective equipment (PPE). Each job is different and will require its own set of PPE. So, don’t forget to do a job site assessment beforehand to see what’s needed. For mowing jobs, wear close-fitting clothes and no jewelry. Pull back long hair. These items can catch in the equipment’s moving parts and cause injuries. To protect your legs and feet from brush or objects thrown from the mower, wear long pants and sturdy, non-slip boots. Do not wear tennis shoes, since they can be easily severed if they get caught under the mower deck. Also, always wear safety glasses to keep debris out of your eyes. The Occupational Safety & Health Administration (OSHA) requires you to wear hearing protection when sound levels exceed certain limits, generally a daily average of 85 to 90 decibels. 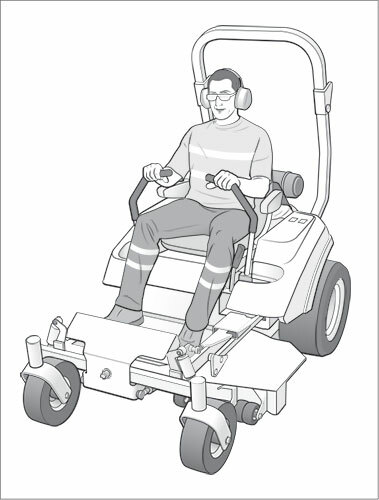 Check the mower operator’s manual to see what type of hearing protection you need. Two common types are muffs and plugs. Make sure you can wear your hearing and eye protection together comfortably. All PPE should be maintained and cleaned regularly to keep it in proper working order. If something breaks or is damaged, replace or repair it before wearing it again. And don’t forget to conduct regular safety meetings to discuss what type of PPE crews should wear and how to properly wear it on different jobs—for their safety and to make sure they are OSHA compliant. All PPE should fit crew members properly, not too loose or tight. Make sure all PPE fits together and is compatible. While PPE is meant to help prevent accidents, operators also need to teach and follow safe practices on the job site. Wear sturdy boots, long pants, safety glasses and ear protection when mowing. All PPE should be compatible and properly fit together. Make sure your clothing fits snuggly, and do not wear jewelry. If you have long hair, pull it back. Maintain PPE, repairing or replacing it as needed.